SPEARFISH, S.D. – The Black Hills State University football team held Chadron State scoreless in the fourth quarter, but ultimately fell, 45-8, on Saturday evening to open the 2018 season. The game, scheduled to kick off at 6:30 p.m., was delayed over two hours due to lightning activity in the area. The Yellow Jackets (0-1) opened the game with the ball, but were unable to move down the field. On the Eagles (1-0) opening drive, they marched down the field, eventually scoring on a 26-yard rushing touchdown by Kevin Coy, Jr. The teams traded off punts, before Chadron State scored another rushing touchdown with 4:59 left in the first quarter. The Eagles led, 14-0 after the first quarter. After a Yellow Jacket fumble set the Eagles up with good field position, CSC scored twice to go up, 27-0. With 8:19 left in the half, Payten Gilmore took the handoff and scored his first touchdown of the year, running in the ball from 31 yards out. The Eagles responded with a touchdown of their own, taking a 34-6 lead into halftime. Chadron State added a field goal on its first drive of the second half, and another touchdown with 4:46 left in the third, to lead, 45-6. After turning the ball over on downs deep in Eagle territory, the Black Hills State defense held firm and recorded a safety on the first play of the drive. Neither team was able to score in the fourth quarter, and Chadron State secured a 45-8 victory. Ryan Hommel threw for 198 yards. Markez Boykin had five receptions for 53 yards to lead the Yellow Jackets, while Gilmore rushed for 59 yards and one touchdown. Defensively, Josh Gurnaby had 13 tackles, including 11 solo. Luis Bach and Cole Miller each recorded one sack. For the Eagles, Coy rushed for 115 yards and three scores. Dalton Holst threw for 150 yards and a touchdown, while TD Stein threw for two touchdowns. The Green and Gold next come home to open their home schedule against Colorado School of Mines. The game, on September 8, is scheduled to kick off at 1 p.m.
GRAND JUNCTION, Colo. --- The South Dakota School of Mines football team was just a play or two away from closing out an outstanding performance during the open game of the 2018 season against the three-time reigning Rocky Mountain Athletic Conference Champion Colorado Mesa Mavericks Saturday afternoon in Grand Junction, Colo. Some bad breaks down the stretch, however, haunted the visiting team, as Mesa escaped with a 36-33 win over the Hardrockers. SD Mines dominated the first half, limiting their opponents to just seven points --- a team that won last year's meeting, 69-7. At halftime on Saturday, the 'Rockers led, 17-7, and managed a wild third quarter to maintain a 30-21 advantage heading into the fourth. Mesa clawed their way back to outscore SD Mines, 15-3, in the final frame and eak out the Week 1 win. Hardrocker senior quarterback Jake Sullivan got his team rolling with two rushing touchdowns of five yards (opening drive) and seven yards in the first quarter. Sophomore place kicker Enis Sefa tacked on extra points on the scores and then added a career-best 44-yard field goal midway through the second period to give his squad a 17-0 edge. Colorado Mesa would get on the scoreboard at the end of the half, using a short field capped off by a four yard touchdown pass. The second half was much like a prize fight. Every time Mesa would throw a punch, the Hardrockers were able to counter and land some lethal shots of their own. The Mavericks opened with a five yard rushing touchdown at the 9:52 mark only to see SD Mines answer right back on the following drive. The 'Rockers used a five-play 73-yard drive capped off by an impressive 47-yard rushing touchdown from Connor Silveria at the 7:40 mark. The point after failed, but the 'Rokers held on to the lead, 23-14. Mesa answered with an 87-yard 13-play drive ending with a one-yard rushing touchdown at the 2:26 mark of the third quarter (extra point good), which pulled them within two points, 23-21. The Hardrockers answered quickly when Sullivan hit senior wide out Isaiah Manley over the middle who then raced into the end zone on a 37-yard TD strike. Sefa was good on the extra point to give SD Mines a 30-21 advantage. Sefa added a 32 yard field goal to open the fourth-quarter scoring, giving the 'Rockers a 33-21 lead with 11:42 remaining in the game. Just when the 'Rockers had their opponents against the ropes, a crucial turnover swung the momentum capped off by a 13-yard TD run (extra point good) at the 9:12 mark, followed by a successful onside kick that resulted in another scoring drive and two-point conversion at the 7:34 mark. That gave Mesa their first lead of the game and the eventual outcome. "We were one play away in any phase of the game from finding a way to win the opener on the road," said Hardrocker football head coach Zach Tinker after the game. "We have much to work on in the next week and need to find a way to finish in the fourth quarter when we have our chances." The Hardrockers finished the game with 431 yards of total offense, while Mesa tallied 472 yards. The 'Rockers racked up 268 passing yards and collected 163 rushing yards. SD Mines had 433 kickoff yards, compared to 264 from the Mavericks. The Hardrockers earned 22 first downs to 24 for CMU. Individually for the 'Rockers, Silveria led the ground game with 79 yards and score on 12 carries. He also collected 50 yards on kickoffs for 137 total yards of offense. Sullivan tallied 58 yards and two scores on 13 rushes and senior Kevin Thompson added 26 yards on six rushes. Sullivan had all the snaps under center, completing 26-41 for 268 with one score and one interception on the last play of the game. Seven Hardrockers caught passes in the game with Manley leading the way. He hauled in nine catches for 117 yards and score. The senior also had 68 yards on kickoffs for 192 total yards. Jeremy Gonzales had 34 yards on five receptions and Joe Luebbers finished with four catches for 30 yards. Sophomore Carson Hunt tallied 49 yards on three catches. Defensively, freshman linebacker Will Carroll paced the 'Rockers with 15 total tackles, one for a loss and forced a fumble. 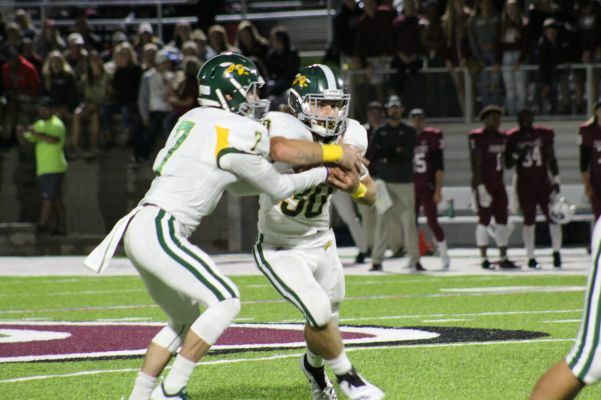 Sophomore linebacker Justin Broekemeier had 11 total tackles, one for a loss, and senior linebacker Andrew Karatepeyan recorded eight total tackles. Junior Michael Retland earned a sack in the game while freshman Adrian Eastman was credited with an interception and a 10 yard return. "I'm encouraged that this team has the spirit, togetherness and leadership to find a way to win in Week 2 against a tough Western State team in front of our home fans at Dunham Field," Tinker added. The Hardrockers home opener is slated for a 1 p.m. start Saturday at O'Harra Stadium against The Mountaineers.